Te Puea Hērangi (centre) was an influential and effective Waikato leader, who was largely responsible for the establishment of Tūrangawaewae marae during the 1920s and 1930s. After Native Minister Āpirana Ngata introduced legislation providing state loans for Māori farmers, she promoted land development in the Waikato region. Her aim was to build an economic base for the people, who had few resources following the confiscation of their land in the 1860s. 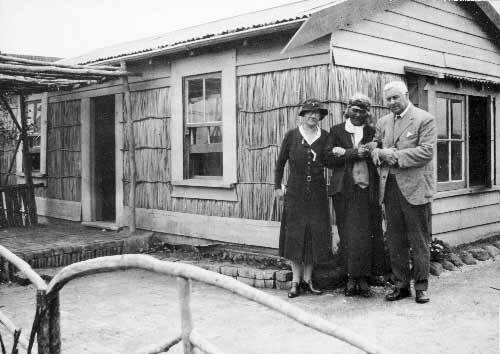 This photograph shows Te Puea with two unnamed people outside a land development scheme house, some time in the 1930s.